Whether you study the theory of capturing races or not, one proverb remains very valuable when involved in such a race: fill outside liberties first. In this race to capture, the circled points are inside liberties and the squared ones are the outside liberties. 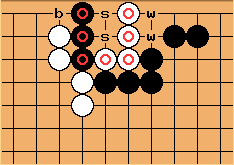 Black must play an outside liberty first to make seki. Playing an inside liberty will kill his own stones. White may disobey and fill an inside liberty first if it's her turn, but it's a bad habit. However, not all capturing races are that clear-cut. Sometimes what looks like an inside liberty turns out to be a move that generates more outside liberties, thus winning the race. See diagonal to the first line. Why are the squared spots not "inside liberties?" If the definition of outside liberty is "The liberties of a group that is involved in a capturing race, which that group doesn't share with the enemy group involved in that capturing race." It seems to me that all of these spots are "shared." Geoff Wedig: Yes, you're missing something: a key fact from the definition. The 'outside' and 'inside' refer to the groups that have potential to be captured. Other groups are part of the surroundings. That is why the squared points aren't inside liberties. They aren't shared by the (potentially) capturable groups.